What to consider before you deploy a Meteor application. How to deploy to some common Meteor hosting environments. How to design a deployment process to make sure your application’s quality is maintained. How to monitor user behavior with analytics tools. How to monitor your application. How to make sure your site is discoverable by search engines. Once you’ve built and tested your Meteor application, you need to put it online to show it to the world. Deploying a Meteor application is similar to deploying any other websocket-based Node.js app, but is different in some of the specifics. Deploying a web application is fundamentally different to releasing most other kinds of software, in that you can deploy as often as you’d like to. You don’t need to wait for users to do something to get the new version of your software because the server will push it right at them. However, it’s still important to test your changes throughly with a good process of Quality Assurance (QA). Although it’s easy to push out fixes to bugs, those bugs can still cause major problems to users and even potentially data corruption! Never use --production flag to deploy! --production flag is purely meant to simulate production minification, but does almost nothing else. This still watches source code files, exchanges data with package server and does a lot more than just running the app, leading to unnecessary computing resource wasting and security issues. Please don’t use --production flag to deploy! Development. This refers to your machine where you develop new features and run local tests. Staging. An intermediate environment that is similar to production, but not visible to users of the application. Can be used for testing and QA. Production. The real deployment of your app that your customers are currently using. The idea of the staging environment is to provide a non-user-visible test environment that is as close as possible to production in terms of infrastructure. It’s common for issues to appear with new code on the production infrastructure that don’t happen in a development environment. A very simple example is issues that involve latency between the client and server—connecting to a local development server with tiny latencies, you just may never see such an issue. For this reason, developers tend to try and get staging as close as possible to production. This means that all the steps we outline below about production deployment, should, if possible, also be followed for your staging server. Environment variables. This is the set of ENV_VARS that are set on the running process. Settings. These are in a JSON object set via either the --settings Meteor command-line flag or stringified into the METEOR_SETTINGS environment variable. Settings should be used to set environment (i.e. staging vs production) specific things, like the access token and secret used to connect to Google. These settings will not change between any given process running your application in the given environment. Environment variables are used to set process-specific things, which could conceivably change for different instances of your application’s processes. A list of environment variables can be found here. A final note on storing these settings: It’s not a good idea to store settings the same repository where you keep your app code. Read about good places to put your settings in the Security article. There are some other considerations that you should make before you deploy your application to a production host. Remember that you should if possible do these steps for both your production and staging environments. It’s always a good idea to use SSL for Meteor applications (see the Security Article to find out why). Once you have a registered domain name, you’ll need to generate an SSL certificate with a certificate authority for your domain. If you deploy to Galaxy, you can generate a free SSL certificate with a single click (courtesy of Let’s Encrypt!). For Meteor, we recommend using a CDN with “origin” support (like CloudFront), which means that instead of uploading your files in advance, the CDN automatically fetches them from your server. You put your files in public/ (in this case public/cats.gif), and when your Australian user asks the CDN for http://mycdn.com/cats.gif, the CDN, behind the scenes, fetches http://myapp.com/cats.gif and then delivers it to the user. While this is slightly slower than getting http://myapp.com/cats.gif directly, it only happens one time, because the CDN saves the file, and all subsequent Australians who ask for the file get it quickly. For all your files in public/, change their URLs to point at the CDN. You can use a helper like assetUrl. Meteor is an open source platform, and you can run the apps that you make with Meteor anywhere just like regular Node.js applications. But operating Meteor apps correctly, so that your apps work for everyone, can be tricky if you are managing your infrastructure manually. 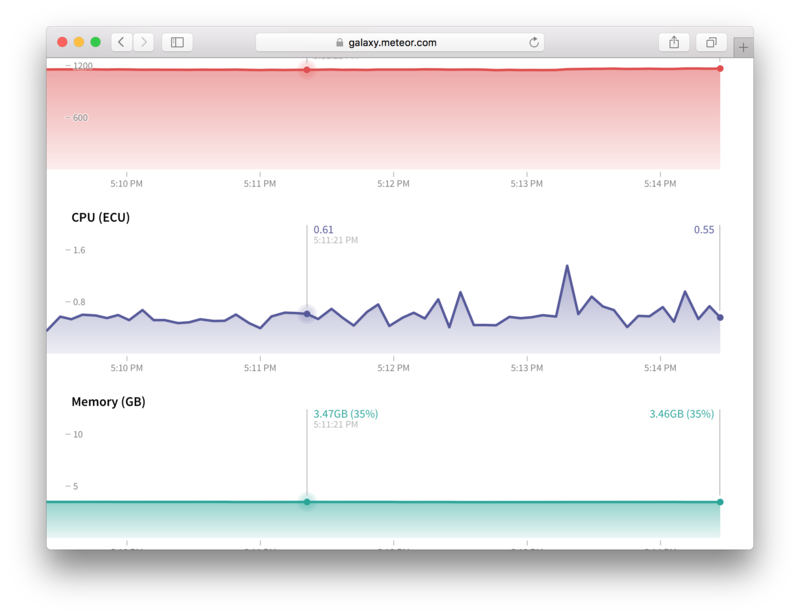 This is why we recommend running production Meteor apps on Galaxy. 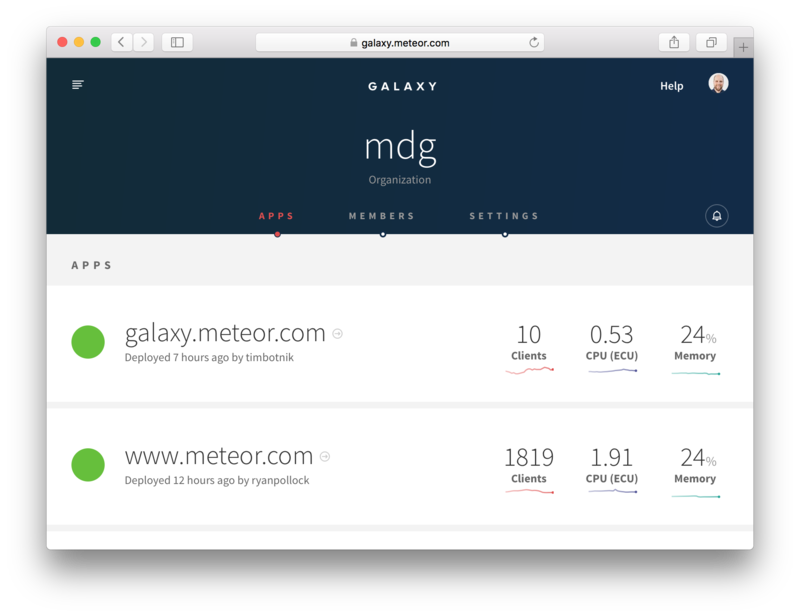 The easiest way to operate your app with confidence is to use Galaxy, the service built by Meteor Development Group specifically to run Meteor apps. Galaxy is a distributed system that runs on Amazon AWS. If you understand what it takes to run Meteor apps correctly and how Galaxy works, you’ll come to appreciate Galaxy’s value, and that it will save you a lot of time and trouble. Most large Meteor apps run on Galaxy today, and many of them have switched from custom solutions they used prior to Galaxy’s launch. In order to deploy to Galaxy, you’ll need to sign up for an account, and separately provision a MongoDB database (see below). To deploy to the EU region, set DEPLOY_HOSTNAME to eu-west-1.galaxy.meteor.com. In order for Galaxy to work with your custom domain (your-app.com in this case), you need to set up your DNS to point at Galaxy. Once you’ve done this, you should be able to reach your site from a browser. You can also log into the Galaxy UI at https://galaxy.meteor.com. Once there you can manage your applications, monitor the number of connections and resource usage, view logs, and change settings. If you are following our advice, you’ll probably want to set up SSL on your Galaxy application with the certificate and key for your domain. You should also read the Security section of this guide for information on how to forcibly redirect HTTP to HTTPS. 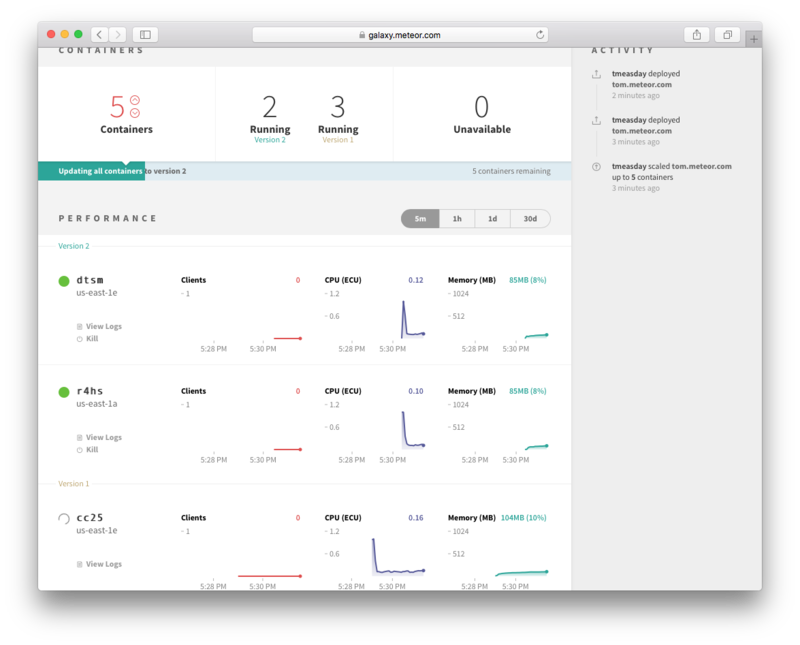 Once you are setup with Galaxy, deployment is simple (just re-run the meteor deploy command above), as is scaling — log into galaxy.meteor.com, and scale instantly from there. Meteor Up, often referred to as “mup”, is a third-party open-source tool that can be used to deploy Meteor application to any online server over SSH. It handles some of the essential deployment requirements, but you will still need to do a lot of work to get your load balancing and version updates working smoothly. It’s essentially a way to automate the manual steps of using meteor build and putting that bundle on your server. You can obtain a server running Ubuntu or Debian from many generic hosting providers and Meteor Up can SSH into your server with the keys you provide in the config. You can also watch this video for a more complete walkthrough on how to do it. The recommendation above is primarily based on current state of maintenance to address upstream security vulnerabilities. Review the Dockerfiles and build scripts to make your own assessment. If you want to figure out your hosting solution completely from scratch, the Meteor tool has a command meteor build that creates a deployment bundle that contains a plain Node.js application. Any npm dependencies must be installed before issuing the meteor build command to be included in the bundle. You can host this application wherever you like and there are many options in terms of how you set it up and configure it. This will provide you with a bundled application .tar.gz which you can extract and run without the meteor tool. The environment you choose will need the correct version of Node.js and connectivity to a MongoDB server. Depending on the version of Meteor you are using, you should install the proper version of node using the appropriate installation process for your platform. To find out which version of node you should use, run meteor node -v in the development environment, or check the .node_version.txt file within the bundle generated by meteor build. For example, if you are using Meteor 1.6, the version of node you should use is 8.8.1. If you use a mis-matched version of Node when deploying your application, you will encounter errors! You can then run the application by invoking node with a ROOT_URL, and MONGO_URL. These instructions are also available in the README file found in the root of the bundle you built above. MONGO_URL is a Mongo connection string URI supplied by the MongoDB provider. Unless you have a specific need to roll your own hosting environment, the other options here are definitely easier, and probably make for a better setup than doing everything from scratch. 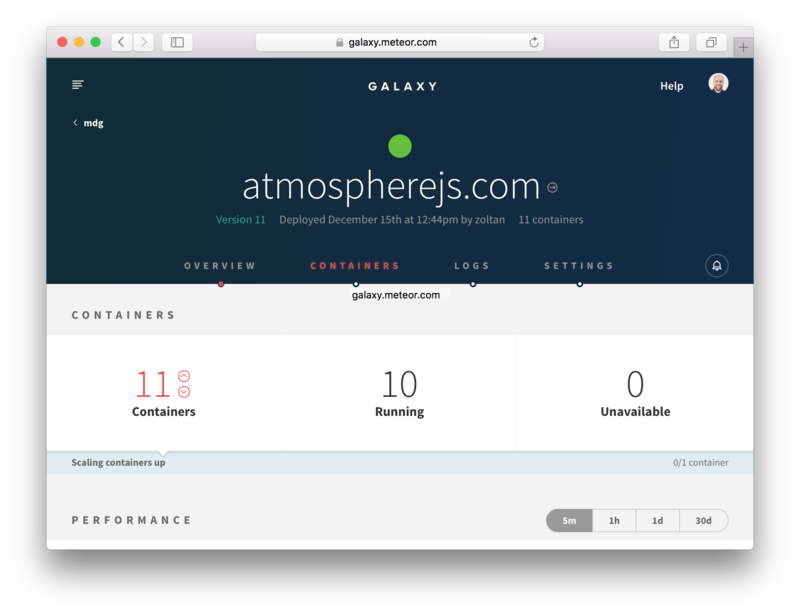 Operating a Meteor app in a way that it works correctly for everyone can be complex, and Galaxy handles a lot of the specifics like routing clients to the right containers and handling coordinated version updates for you. When you deploy your Meteor server, you need a MONGO_URL that points to your MongoDB database. You can either use a hosted MongoDB service or set up and run your own MongoDB server. We recommend using a hosted service, as the time saved and peace of mind are usually worth the higher monthly cost. In either case, the database should be hosted in the same region as the Meteor server (for lower latency). For example if your app is hosted on Galaxy in us-east-1 (on AWS), then you could create a database on Compose in AWS us-east-1 or on Amazon Lightsail in us-east-1. Instance configurability – Independently configure your CPU, memory, storage and disk I/O speed. You can read this detailed guide by OK GROW! for step-by-step instructions to deploying a production ready MongoDB database on MongoDB Atlas. You can install MongoDB on your own server—one you own, rent, or a VPS (recommended) like DigitalOcean or Lightsail. As you can see from the above section, there are many aspects of database setup and maintenance that you have to take care of. For example, to get the best performance, you should choose a server with an SSD large enough to fit your data and with enough RAM to fit the working set (indexes + active documents) in memory. Although it’s much easier to deploy a web application than release most other types of software, that doesn’t mean you should be cavalier with your deployment. It’s important to properly QA and test your releases before you push them live, to ensure that users don’t have a bad experience, or even worse, data get corrupted. Deploy the new version of the application to your staging server. QA the application on the staging server. Fix any bugs found in step 2. and repeat. Once you are satisfied with the staging release, release the exact same version to production. Run final QA on production. Steps 2. and 5. can be quite time-consuming, especially if you are aiming to maintain a high level of quality in your application. That’s why it’s a great idea to develop a suite of acceptance tests (see our Testing Article for more on this). To take things even further, you could run a load/stress test against your staging server on every release. Continuous deployment refers to the process of deploying an application via a continuous integration tool, usually when some condition is reached (such as a git push to the master branch). You can use CD to deploy to Galaxy, as Nate Strauser explains in a blog post on the subject. It’s important to understand what happens during a deployment, especially if your deployment involves changes in data format (and potentially data migrations, see the Collections Article). When you are running your app on multiple servers or containers, it’s not a good idea to shut down all of the servers at once and then start them all back up again. This will result in more downtime than necessary, and will cause a huge spike in CPU usage when all of your clients reconnect again at the same time. To alleviate this, Galaxy stops and re-starts containers one by one during deployment. There will be a time period during which some containers are running the old version and some the new version, as users are migrated incrementally to the new version of your app. If the new version involves different data formats in the database, then you need to be a little more careful about how you step through versions to ensure that all the versions that are running simultaneously can work together. You can read more about how to do this in the collections article. It’s common to want to know which pages of your app are most commonly visited, and where users are coming from. Here’s a setup that will get you URL tracking using Google Analytics. We’ll be using the okgrow:analytics package. The analytics package hooks into Flow Router (see the routing article for more) and records all of the page events for you. To achieve a similar abstraction for subscriptions/publications, you may want to write a wrapper for Meteor.subscribe(). When you are running an app in production, it’s vitally important that you keep tabs on the performance of your application and ensure it is running smoothly. Although a host of tools exist to monitor the performance of HTTP, request-response based applications, the insights they give aren’t necessarily useful for a connected client system like a Meteor application. Although it’s true that slow HTTP response times would be a problem for your app, and so using a tool like Pingdom can serve a purpose, there are many kinds of issues with your app that won’t be surfaced by such tools. If your application contains a lot of publicly accessible content, then you probably want it to rank well in Google and other search engines’ indexes. As most webcrawlers do not support client-side rendering (or if they do, have spotty support for websockets), it’s better to render the site on the server and deliver it as HTML in this special case. If you’re using Galaxy to host your meteor apps, you can take advantage of built-in automatic Prerender.io integration. Add mdg:seo to your app and Galaxy will take care of the rest: loading the code and configuring it with Galaxy-provided credentials. If you’re not using Galaxy, you can still use mdg:seo. You will need to sign up for your own Prerender.io account and provide your token to the mdg:seo package in Meteor.settings. You can also do this if you use Galaxy but would prefer to use your own Prerender.io account with more frequent cache changes. You can also use the prerender-node NPM package directly, mimicing the small amount of client and server code in the Atmosphere package; do this if you need to use a newer version of the NPM package than the one in mdg:seo. Chances are you also want to set <title> tags and other <head> content to make your site appear nicer in search results. The best way to do so is to use the kadira:dochead package. The sensible place to call out to DocHead is from the onCreated callbacks of your page-level components.